Imagine being able to fly with your baby safely sleeping on the seat beside you in their own little harness? It's possible on this airline, thanks to a system Air New Zealand calls the “Skycouch." It's a “row of three Economy seats joined together to create a flexible space," according to the Air New Zealand website. A special seatbelt dubbed a “Cuddle Belt" keeps two passengers buckled in as they sleep (cuddling for sure, it's tight) while laying across the three seats. The Skycouch has been around for seven years, but its baby-friendly makeover and new accessories—a kid-friendly, updated Cuddle Belt; and the Infant Harness, Infant Belt and Skycouch Pod—are new as of 2018. “While we initially marketed it to couples, we quickly found the product suited parents with young families especially well. 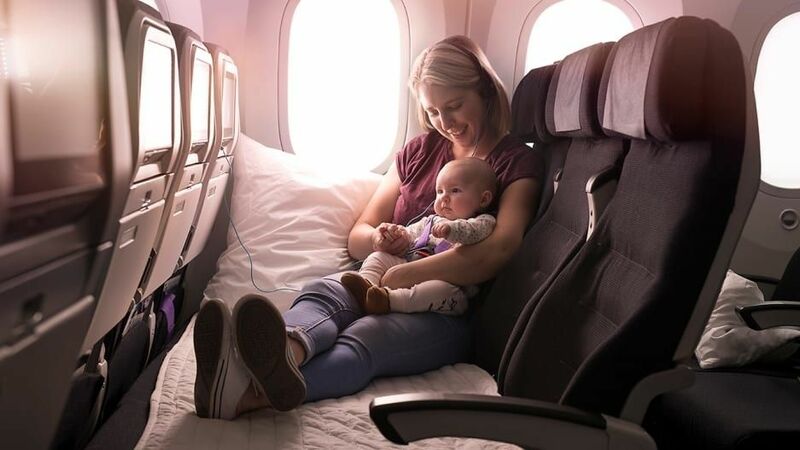 Parents can relax while their children are able to have their own space and flat area to play without interrupting other passengers," Air New Zealand's General Manager of Customer Experience, Anita Hawthorne, explains. "Through this process, we've spoken to many customers who have travelled on the Skycouch and their feedback has helped to inform the updates and refinements we're introducing this year." Previously the Cuddle Belt only allowed two adults or an adult and a child to lie down across the three seats, but it's now been redesigned so two kids could sleep, outstretched and side by side. This way, parents don't have to wake up (potentially grumpy) little ones to put on their seat belts during seatbelt-sign time. Sounds amazing. Babies on the Skycouch need to sport the Infant Harness. It comes in three sizes to fit babies between 0-39 pounds and up to 3.6 feet tall. With that on they can sleep inside the Skycouch Pod (a little bassinet) with the infant belt looped through their harness. They can also sleep on mom or dad with the adult seat belt looped through, or bigger babies can relax right on the Skycouch. It's a really smart system. The only downside of the Skycouch is that it does cost more than regular economy seats would. The cost isn't listed online as the upgrade charge varies depending on where you're flying to and how many people are in your Skycouch party. It's probably not insignificant though. Still, if you've got little ones and you're dreading an international flight, it might be worth asking about. Skycouch is available on all Air New Zealand long-haul flights from the US—so out of Los Angeles, San Francisco, Houston and Honolulu. Hopefully the Skycouch catches on with other airlines, too, because seriously, who wants to wake up a sleeping baby when you don't have to? Is it safe to fly in your third trimester, like Khloe Kardashian?